Plate Size ( W x L ) 3-15/16" x 4-1/2"
Phenolic caster wheels are recommended for smooth concrete and can be used for storage (standing) loads without permanent set. 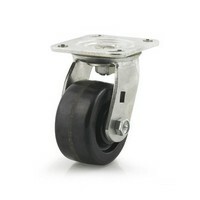 These caster wheels are highly resistant to oil, grease, gasoline and mild acids. It is not recommended for wet applications where the wheel will be in standing water. They are affected in various degrees by strong acids and some alkaline solutions. Temperature range is -40° to +250° F, with intermittent use up to 300° F. The wheel material may chip or cut from contact with steel plate or from rolling over steel parts on the floor. Plate Size: 3-15/16" x 4-1/2"
Wheel diameter from 4" to 6"